Do you feel a broken record – repeating the same instruction to your child over and over? Not sure whether to book them in for a hearing test or yourself into the looney bin? 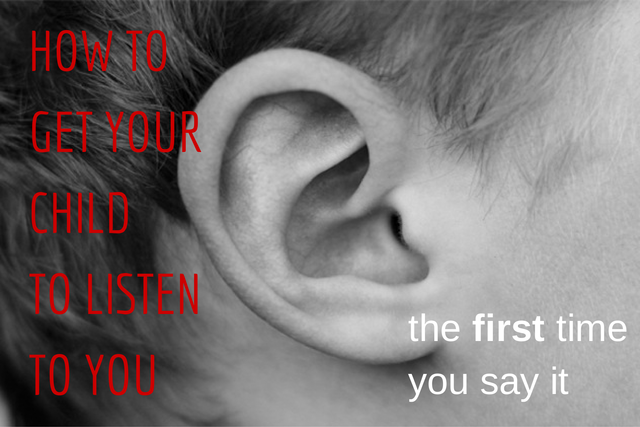 How can you get your child to listen to you the first time you say it? I used to go nuts over my boys’ inability to hear me. I got louder and louder until I’d morphed into a crazed chronic shoutaholic. Things got really out of control. I became a parenting book junkie, eating up anything that would help me get a handle on the chaos and stress of raising two boisterous little boys. It wasn’t until I did a 10 week Parenting Skills Course at The Parent Practice that I finally cracked the secret to getting my kids to listen to me the first time I say it. So what do we do? We repeat. And we repeat again, louder and more annoyed. And again, this time with exasperation, then anger. We’ve inadvertently trained our child to only really pay attention once we’ve said it a few times or have begun shouting. To gain better cooperation with your child you’re going to have to change your own behavior first. Gulp. This was a hard pill for me to swallow too. We want to blame them and make them be the ones to change, but the change begins with us. We need to stop taking it personally when they ignore us and that’s easier to do when you accept that it’s not about you. Kids need to learn how act and the best way to teach them is by example, not getting mad at them. Has your kid ever wanted your attention and you’ve said ‘Yeah, in a minute’ and then a minute goes by and you’re annoyed that they’ve already asked again? We’re being hypocrites by expecting them to listen to us, but not vice versa. 1. Sit down and have a chat. Lovingly explain that you’re no longer going to shout or repeat and from now on when you ask them to do something, they’ll need to do it. Without blaming them, try to describe how you feel when they don’t listen. Tell them how happy you’ll feel when you don’t have to repeat or shout to be heard. 2. Write it down as a rule. When it’s there in black and white you can point to the rule, rather than saying it all over again. Reward them with positive feedback each time they cooperate. Remember that the rule applies to you too. Just as you’re expecting your child to form a new habit of listening to you, it will be just as challenging for you to form a new habit in the way that you give instructions. (See steps 3 & 4 below.) You’ll also need to model the behavior you want to see by listening to them when they need you. It’s a two-way deal. 4. Get into their space. If you’re in the habit of barking orders from one room to another, this will be a new challenge for you, but worth the effort. Go to them. Engage them. Get them to look at you. Have them repeat the request back to you. It’s hard to validate that your child feels it’s just as important to finish his video game as you feel it’s important he comes to eat the meal you’ve just prepared. But imagine if you were in the middle of a great TV show and your husband suddenly burst in and ordered you to look at some tax papers NOW. Would you immediately switch it off and gleefully skip to the next room with him? Or would you feel annoyed and pissed off or try to worm your way out of it? So, knowing that dinner is nearly ready, give your child the heads up that in five minutes they’ll need to come to the table. Don’t shout this out from the kitchen. Stop what you’re doing and go to them. Make eye contact and tell them in person. If your child is engrossed in something, take a moment before giving your instruction to engage with them about what they’re doing. It feels like it will take a long time to stop what you’re doing to go to your child, engage them, give the instruction and have it repeated back, but let’s compare this to shouting the instruction from another room several times. By the time he comes to the table you’re peeved that you had to repeat and yell, he’s upset that he had to stop watching his show and now everyone’s in a bad mood. He may play-up during his meal and then you have yet another battle on your hands. By taking just a minute to give the instruction politely, in person, you’ll both feel happier and more relaxed. Always remember to give positive feedback every time they listen to you the first time. If you find yourself slipping back into repeating yourself, start over again. Remember it takes time to establish new habits. If you or your child slip up, take a deep breath, see it as a mistake, be forgiving – then try, try again! Whenever I’m complimented on how well my boys listen to me, I smile. It isn’t always easy and we still have our moments, but I wouldn’t go back to the way things were for anything. In the comments below, share your thoughts. Does your child have selective hearing? Is this is a challenging area for you? Are you willing to put in some effort yourself to make positive changes? This could t have come at a more perfect time. My ten year old and I had it out yesterday. Admittedly I am a yeller especially when I am stressed or feeling rushed. I use post it notes for every other reminded, now I will make up a few more for this! I really loved this article! What a great reminder for a Monday morning. It is amazing how doing these things not only makes you put an end to the yelling, it creates a bond with your child that is priceless. I really like your thorough discussion of point #5. I recently wrote a post (more geared for dealing with adults)… but same idea. We need to respect other people’s time and priorities if we want to get good results. Very interesting about training our kids to only respond when we yell or repeat ourselves. Sort of like hitting the snooze button, which can end up training us not to get up when the alarm goes off! Thank you Kelly for the acknowledgment of learning this stuff with us here at The Parent Practice. So pleased to hear the skills are still impacting on family life – they are gold dust aren’t they? If only every family could follow these simple steps then nagging; repeating and reminding would be a thing of the past! You are SO welcome Elaine! Can you believe I did my parenting skills classes with you at The Parent Practice when my boys were 3 and 6 – and they are 11 and 14 now?! Your words and wisdom still stick. I’m so happy to be in a position to help spread the word. The work you do is invaluable and I recommend parenting skills classes to every parent! Why struggle and suffer where there is so much great help out there? Absolutely Kelly – think we are 60 days away from the online Parenting Academy and watch out for the various membership levels, so something for everyone. Thanks again Kelly! You are always right on with where I am in life! Love everything you do. But I have to add I have a big house and leaving the kitchen to go physically look the boys in the eye is going to be a struggle. I know it will work because it makes total sense. … just hard. 😉 Hope this finds you well. Tish, at least now you know that when you do shout out an instruction from another room and they don’t respond, it’s up to you to stop what you’re doing and physically look for them, rather than blaming them and getting mad. Yes, it’s hard! Lisa I’m thrilled for you to be doing a course in Sept, with The Parent Practice! It was such a turning point in my parenting ‘career’ and changed my family life for the better in ways I never dreamed possible. Please let me know how you get on! Cracking article Kelly. I definitely need to take this on board especially during the summer holidays – or I might end up in the looney bin! This is one that definitely needs to be shared with stressed out Mums everywhere. Really good article – I could have done with following this advice some years ago!! Now my major disagreement with the kids is about the meaning of time – when I ask “how long will you take to do X” and get the answer “just a minute” this could mean anything up to half an hour which means planning is impossible! Glad you liked it Maxine – and it’s never too late to begin. Changing old habits takes time, but it’ll be worth it. I’m not sure how old your kids are, so it’s tough for me to say whether they might be too young to understand how long a minute is or to calculate how long it’ll take them to do something. As soon as my husband gets home, we’re going to follow all of these steps, and let the girls know, there will be no more yelling. I’m so excited about this because once I yell, I’m spooled up for the rest of the day, and I find I yell more—ugh! Yeah, I used to catch myself shouting at my kids to STOP SHOUTING…. yikes. Please report back Mariah. Good luck!!! Indeed Mari-Liis! Thanks so much for sharing that sweet example for us all! Kelly, I so enjoyed reading this, seeing your mention of The Parent Practice and your lovely share of my agenda mantra! Were you in a class of mine at TPP? I’m coming back in February. Hope I’ll see you. I used to listen to your 6 CD disc series ‘When Your Kids Push Your Buttons and What You Can Do About It’ on a continuos loop in my car about 8 years ago. It helped me tremendously! I never got to attend one of your live classes with The Parent Practice and now that I’m living in Madrid it looks like I’ll miss your February talk too. I will spread the word though! Your mantra: ‘My child’s agenda is as important to him as mine is to me’ has become my mantra and has helped me see things through the eyes of my children. Great post! When fall into bad habits from time to time, I have to slow it down and I will make my kids repeat the instructions. I will ask them what I just told them and make them repeat it back. Sometimes, they honestly don’t know. That is frustrating, but when I repeat it, then THEY repeat it, everybody is on the same page. More things get done and there is a lot less frustration which leads to a lot less yelling! Really great post Kelly!! It really goes to show that when you ask them to repeat it back and they can’t – they really hadn’t heard you the first time. So worth doing! So timely! I have been having this battle with my 4 year old son and it’s driving me bonkers. I’m going to give this a try! Fantastic Camesha – remember, it doesn’t happen overnight and consistency is the key. Good luck and thanks for commenting!